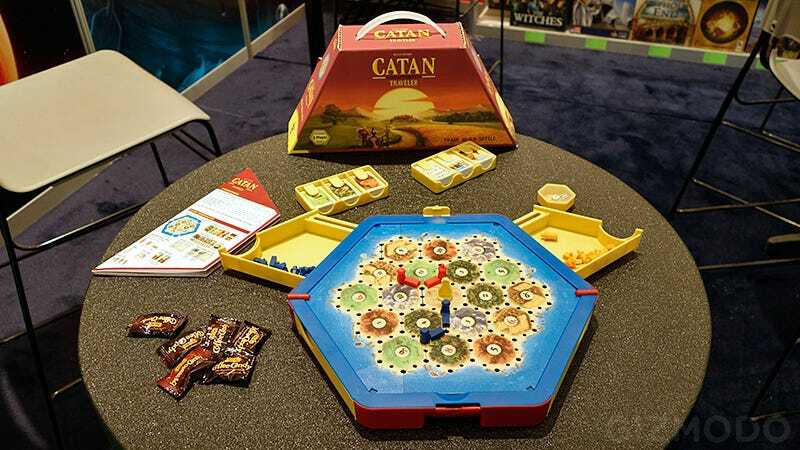 For players who can't bear the thought of being away from their favorite board game, there's a Portable Edition of Settlers of Catan that's been around for years now. But it comes packed in a flimsy cardboard box full of tiny cards and pieces that are easy to lose. That's why this new Compact Edition of Settlers of Catan, which folds up on itself for easy transport, is vastly superior in every way. You lose the ability to completely customize the game board, because the various hexagonal tiles are grouped into larger modular two-sided pieces. But there's still plenty of room to mix things up every time you play to keep things new and interesting. There are also slide-out drawers for safely storing the playing pieces and resource cards during transport, and the whole thing folds into a self-contained trapezoid-shaped case that can easily squeeze into a suitcase.